William Law – English spiritual writer and mystic. Law was born at King’s Cliffe, Northamptonshire. In 1705 he entered as a student at Emmanuel College, Cambridge; in 1711 he was elected fellow of his college and was ordained. He resided at Cambridge, teaching and taking occasional duty until the accession of George I., when his conscience forbade him to take the oaths of allegiance to the new government and of abjuration of the Stuarts. His Jacobitism had already been betrayed in a tripos speech which brought him into trouble; and he was now deprived of his fellowship and became a non-juror. For the next few years he is said to have been a curate in London. By 1727 he was domiciled with Edward Gibbon (1666-1736) at Putney as tutor to his son Edward, father of the historian, who says that Law became “the much honoured friend and spiritual director of the whole family.” In the same year he accompanied his pupil to Cambridge, and resided with him as governor, in term time, for the next four years. His pupil then went abroad, but Law was left at Putney, where he remained in Gibbon’s house for more than ten years, acting as a religious guide not only to the family but to a number of earnest-minded folk who came to consult him. The most eminent of these were the two brothers John and Charles Wesley. The household was dispersed in 1737. Law was parted from his friends, and in 1740 retired to King’s Cliffe, where he had inherited from his father a house and a small property. There he was presently joined by two ladies: Mrs Hutcheson, the rich widow of an old friend, who recommended her on his death-bed to place herself under Law’s spiritual guidance, and Miss Hester Gibbon, sister to his late pupil. This curious trio lived for twenty-one years a life wholly given to devotion, study and charity, until the death of Law on the 9th of April 1761. Law wrote in three areas. In the area of controversial writings the first was Three Letters to the Bishop of Bangor (1717), which were considered by friend and foe alike as one of the most powerful contributions to the Bangorian controversy on the high church side. His Letters to a Lady inclined to enter the Church of Rome are excellent specimens of the attitude of a high Anglican towards Romanism. His controversial writings have not received due recognition, partly because they were opposed to the drift of his times, partly because of his success in other fields. In the area of practical divinity he wrote such works as The Serious Call to a Devout and Holy Life (1728), together with its predecessor, A Treatise of Christian Perfection (1726), which deeply influenced the chief actors in the great Evangelical revival. The Serious Call affected others quite as deeply. Samuel Johnson, Gibbon, Lord Lyttelton and Bishop Horne all spoke enthusiastically of its merits; and it is still the only work by which its author is popularly known. It has high merits of style, being lucid and pointed to a degree. 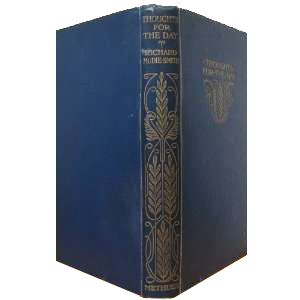 Though the least popular, by far the most interesting, original and suggestive of all Law’s works are those which he wrote on mysticism in his later years, after he had become an enthusiastic admirer (not a disciple) of Jacob Boehme, the Teutonic theosophist. From his earliest years he had been deeply impressed with the piety, beauty and thoughtfulness of the writings of the Christian mystics, but it was not till after his, accidental meeting with the works of Boehme, about 1734, that pronounced mysticism appeared in his works. Law’s mystic tendencies divorced him from the practical minded Wesley. These include The Spirit of Prayer (1752); The Way to Divine Knowledge(1752); The Spirit of Love (1754); A Dialogue between a Methodist and a Churchman (1760 ); and An Humble, Earnest and Affectionate Address to the Clergy (1761).